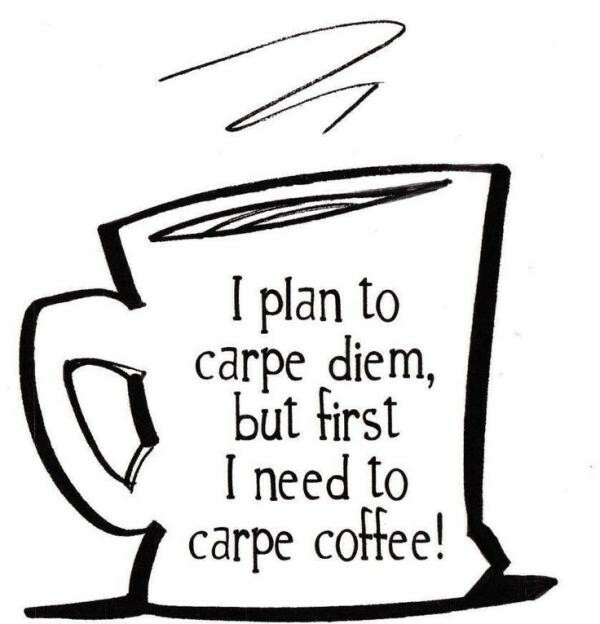 Coffee Matters – In Search of My Morning Java – "Aye…brilliant"
Coffee – that great eye opener of the world. For me, it’s what gets me out of bed and walking upright. Like many of you, I look forward to that first big mouthful from the steaming cup cradled in my hands. Italy has long been known for its coffee culture and in the few weeks I have been here,I have seen more espresso machines than I’ve seen all my life. Big, shiny, retro looking pieces of machinery that command a place front and centre behind the counter, looking too complicated for anyone other than a qualified, diploma waving barista to operate. Drip coffee, like that served by Tim Hortons and Dunkin’ Donuts and in nearly every restaurant and home in North America, is non-existant. 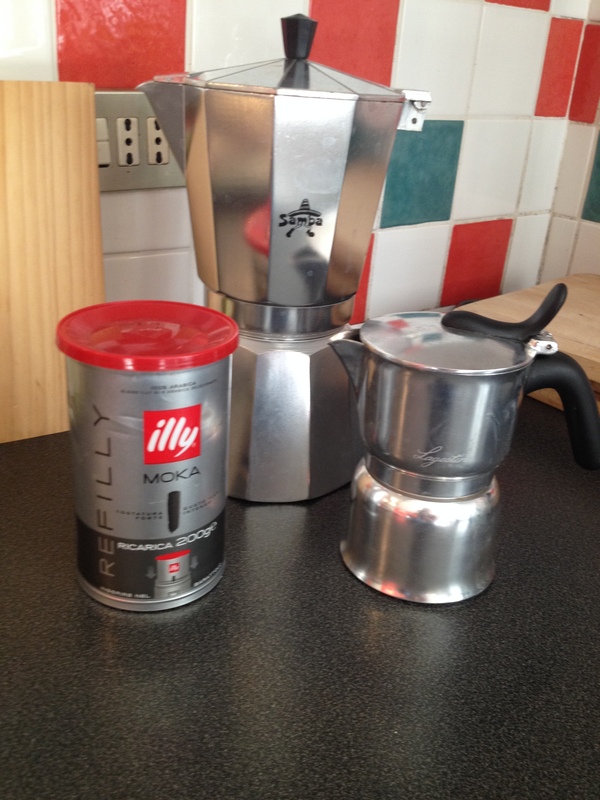 Here, coffee is pretty basic -espresso and for something quick it’s instant (think Nescafe). Every village, no matter how small, has at least one bar not to be mistaken as a place to drink just alcoholic beverages. Top drink served is coffee – espresso and cappuccino and espresso poured over ice. If you’d like to add a shot of something – rum, whiskey, Baileys, etc. – the bottles are proudly placed above the big shiny espresso machine (the red ones remind me of classic cars). Each truck stop and gas station has one of these impressive machines and people come in, order an espresso (always served in a teeny cup with a small glass of water on the side). They stand at a counter, drink it in one or two gulps and off they go. Cappuccinos require an extra minute as they are sipped. There is no messing about drinking coffee and dilly-dallying at the same time. The dilly-dallying comes afterwards, maybe over a beer 11:00 AM or queued up at the local post office. But, I digress…I just wanted a cup of coffee to start my day off right. Simple, yes? Not really. This house does not have a coffee maker. No Proctor Silex or GE machine with paper filters. In the cupboard was a bottle of Nescafe Classic – strong – 100% puro caffe. No big deal as I grew up with Nescafe, Carnation milk and too much sugar. It would do until I found a proper coffee machine – for me that’s a french press. I use one at home in St. John’s (all regular coffee makers have a short life span in my possession). Every time I spied a shop selling kitchen items or household appliances, I scoured the shelves for either a coffee press or a regular coffee maker. No such luck. 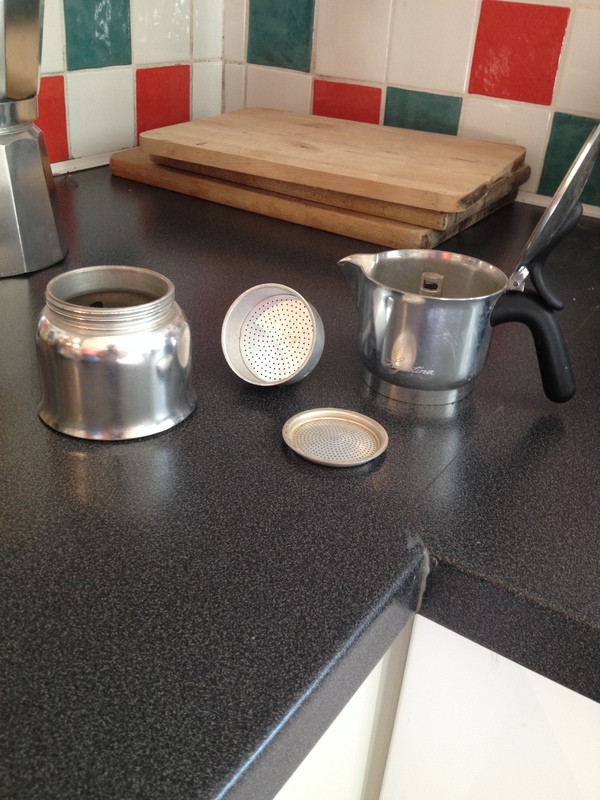 All that I could find were stove top espresso makers – one large (8 espressos) and one small (2 espressos). I purchased both along with some really good coffee. I could do this! The big pot was a bust – I should have known it had issues as it came with spare replacement handles in the box. Not to be discouraged, I tried over and over to make the perfect cup of espresso, to which I would add hot water, thereby creating an espresso. Nasty brew came out of that pot. It took too much coffee and took ridiculously long to brew on the gas hob and when I finally got fed up and poured myself a shot, added the hot water, sugar and milk – all I could do was shudder and say “Pass the Nescafe please”. Oh – I forgot…the handle broke while I was washing it out. The itty, bitty pot was not without its challenges. The first attempt was weak and reminiscent of airplane coffee. Just not good, but could be laced with copious amounts of milk and sugar to make it palatable. Second pot was better. The third pot cost me a days work cleaning the kitchen – I forgot to put in the little strainer part. I turned my back, walked away. Whoosh! Pop! Hiss…the burner went out. And the kitchen was dripping. Mr. Muscle and I spent the better part of the morning cleaning walls, floors, cupboards, cushions, iPads – coffee grounds and hot water settle into some awfully strange spots. I decided against coffee that morning. I’ve since gotten the hang of the little espresso pot (I’ve been watching Angela at Nives,our local bar and gelateria) and my Americano tastes pretty good at 6:30 AM. More importantly, it does its job of waking me up and preparing me for the day. It’s fast, efficient, easy to clean and makes two cups for one, or one for me and one to share. 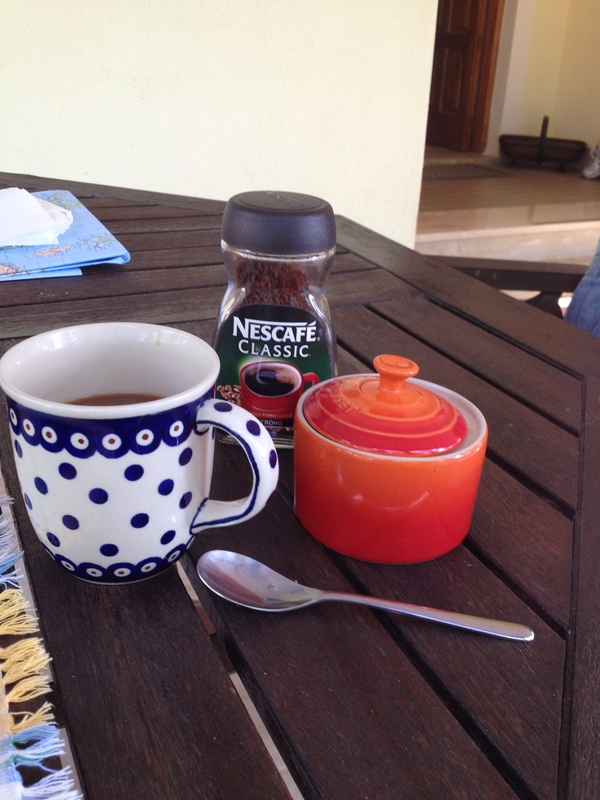 On the days I’m in a hurry or am just plain lazy (in 30 plus degrees, who wouldn’t be) I must confess that I fall back on Nescafe. And it does me just fine. So, if you happen to come to Italy, don’t expect your daily brew to be like home. Coffee is different here. Forget Tim’s and Starbucks. Embrace the Italian coffee culture of espressos and their offspring. And if you’re like us and don’t mind hearing “Ah…tourista, si?”, then order your espresso and drink it at your table, savoring every sip. Order your cappuccino after 11:00 AM and don’t mind the questioning look, a lift of the eyebrows and “Cappuccino?” repeated a couple of times (Italians don’t drink cappuccinos after 11:00 AM). Just enjoy being a tourist, sit down for a chat or some people watching and appreciate Italy’s fabulous coffee. But whatever you do, do not order a latte – all you will get is a large glass of cold, white milk! Posted on July 22, 2015 July 22, 2015 by jacquieharnettPosted in Food and drinkTagged coffee culture, Italy.